By now we all know Red Bull has one of the hottest YouTube channels and knows how to grow an audience, landing more than 826 million video views and 3.6 million subscribers so far. But as our VideoAmigo.com SaaS platform has shown over the past year, views are not enough and is not the most important metric for measuring channel success. Now don’t get us wrong, Red Bull is killing it on YouTube, but even they can build a more authentic and rabid fan base if they tweak their strategy even a little bit. Marketers need numbers to analyze their success, help them set strategy for the next campaign, and compare traction against competitors. YouTube’s API directs marketers toward views and subscribers as a great way to do this, but their view counts include those from both organic views and :15 and :30 pre-roll ad spots, mashing them all together to present one number of measurement. It’s an apples to koala bears comparison, which has always bugged us a bit. 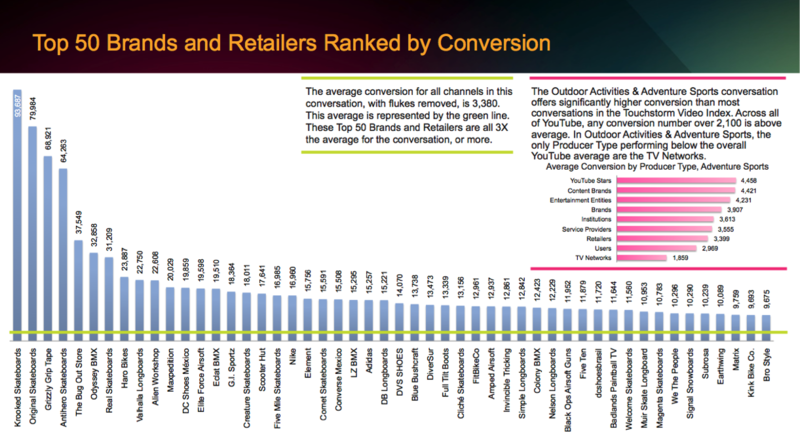 And so we’ve done something to clean it up and improve the way marketers view and measure their YouTube presence. 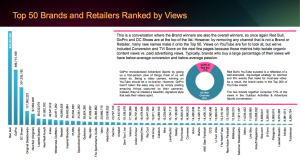 Views are the most common way channels are judged — the more the better, right? 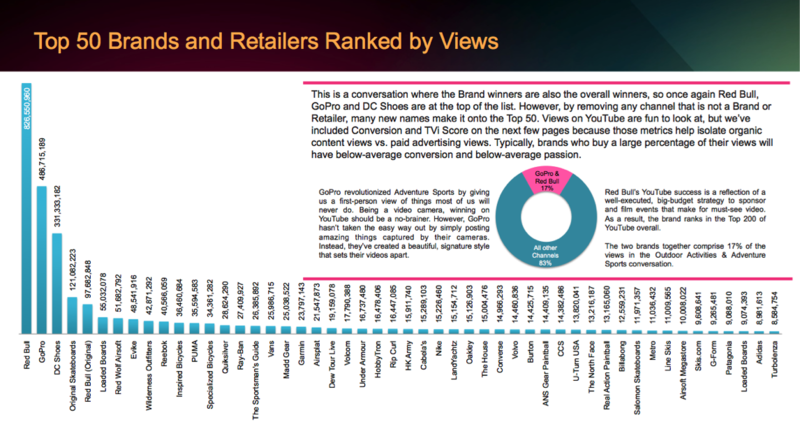 Including all nine producer types, Red Bull is the undisputed leader, followed by Discovery Networks, GoPro and DC Shoes, who all master YouTube in views. But, these view numbers include purchased pre-roll — you know, the short ads you’re forced to watch before the one you want. Mixing content apples with advertising koalas (to ride that metaphor to death) makes it difficult to tell who’s generating genuine consumer passion and loyalty vs. those who buy YouTube to gain exposure for their TV spots. 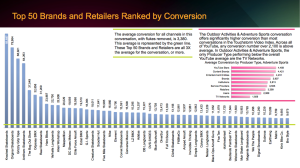 Both are excellent uses of YouTube, but view counts in isolation obscure the social media strength of YouTube by hiding what consumers are naturally responding to. This is one of many reasons why it’s important to look beyond views when judging channel health. 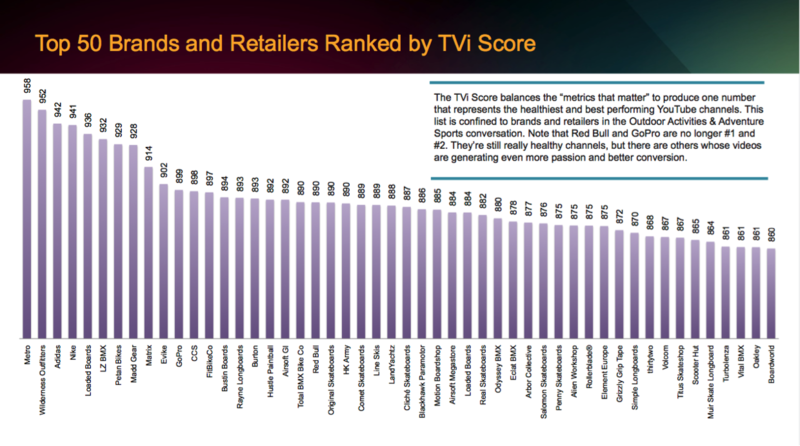 Notice that when we went from Views to TVi as the core measurement we see only one consistent brand. Props to Loaded Longboards for keeping those views high, and that fan engagement even higher! 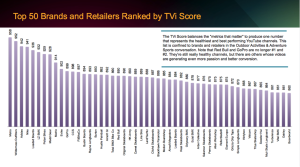 There’s a great opportunity for brands to maintain a strong advertising strategy but then separate their metrics around building authentic connections with audiences by checking their strategies against the TVi Score metrics above. With this new measurement in place, you can look inside the full report for who’s doing it well and who needs to tighten the strategy reigns a bit. It’s an important exercise for channel managers to go through, as authenticity is the tortoise who will eventually win the race.